Hike Leader Barbara Martin and Debra Fisher, Marian Styles and Andre Meyer had a delightful hike on the always beautiful Apple Orchard Falls and Cornelius Creek Trail circuit. The weather was clear and beautiful and the autumn leaves just beginning to fall. On today’s 5.5-mile “clip and clomp hike,” I was joined by David Crowe, C.J. Woodburn, Lindsay Brown, Pete and Bev Fink, Marian Styles, Karen Siegrist, John Shannon, Dave Bennick, Rosette and Lloyd Moss, Virginia Masterson, Kyna Nelson, Don Blume, and Mike Smith. We consolidated cars at the Food Lion parking lot in Elkton before the 10-minute drive to the trailhead. Just before starting the hike, Mike Smith warned everyone that rattlesnakes are uncomfortably common in the area. Almost immediately, we saw a dead one on the road. 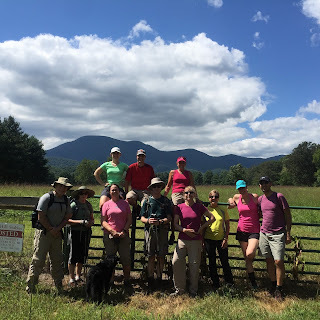 Most of us brought loppers or clippers and work gloves, and we cut back on some the blueberries closing in on the trail as we ascended to Kaylor Knob. Despite intense heat and humidity, many of us worked hard clearing the trail as we went along; cooling breezes were almost nonexistent. We had lunch at the top, avoiding a container of a woman’s ashes, which had been placed where we used to sit. During our break, some hikers appreciated the appearance of cookies from the Dayton Farmers’ Market. The once great view at Kaylor Knob is now obscured by chestnut trees, but we did enjoy some views to the east on the way up. No one spotted the 80-year-old CCC trail marker along the way or a live rattlesnake. We got spread out a bit on the way down but regrouped at the bottom of Second Mountain at the first stream crossing. Dave and Don took a brief side trip to see the Boone Run shelter, but it was a so hot that no one joined them. 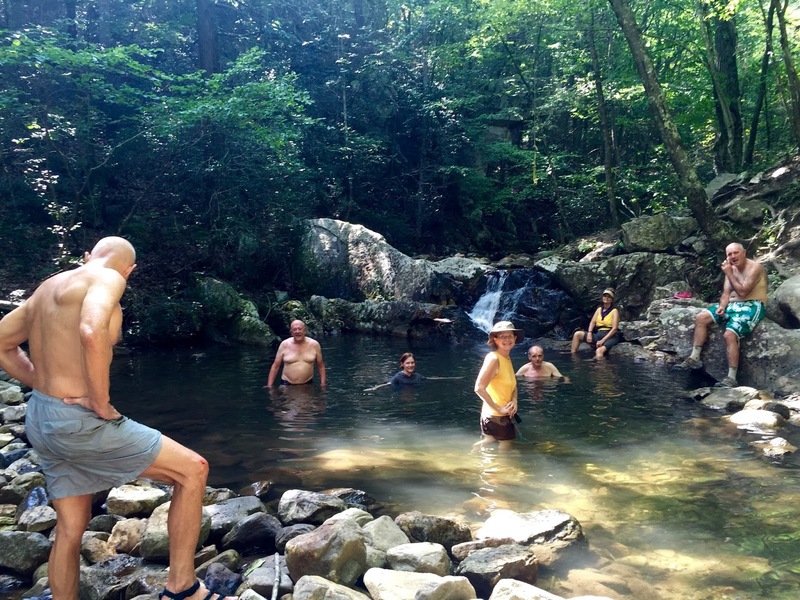 Just before we got back to our cars, we detoured to a swimming hole. There we met Ginny Barber and Nancy Handley, who just missed us as we left the Food Lion in Elkton. 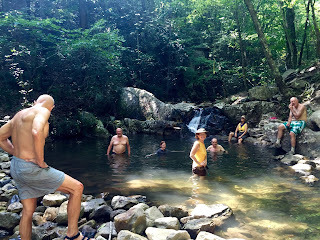 They reported doing a good hike up Boone Run before we finally met up at the swimming hole. Most of us jumped or at least dipped in, but no one stayed in long; the water was refreshing but cold. For some of us, a cooling dip was the best part of the day. The Charlottesville Potomac Appalachian Trail Club joined forces with the Flying McLeods Crew of the Southern Shenandoah PATC to do trail work on the Appalachian Trail between Doyles Run Parking area and the junction of the access trail to Loft Mountain Amphitheater on September 10. Much of the 1.8 mile section was very overgrown, and in some areas nearly closed-in. Eight members of our club volunteered including Iva Gillet, Bill Holman, Jeanne Siler, John Shannon, Dave Abdallah, Jodi Frederiksen, Mark Perschel, and Marit Anderson (work trip leader). Overseers Don White and Heather Warren spearheaded the project and five folks from the DC area also met up to do the trail maintenance - John Steer and sons, Jack and Tucker, Karen Reinauer and John Huennekens. We divided up into small groups to use brush cutters, line trimmers, and small cutting tools including loppers, hand pruners, Corona saws, and swing blades. The hard working, efficient crew was able to complete the entire section in about 4 hours. Lunch break was on a large rock with time for conversation and sharing dessert items of sweet bread, chocolate chip cookies, and Peanut M&M's. Flying McLeod leader, Don White, was extremely happy and appreciative with our work. A cooler of adult refreshments was the final reward of the day as we prepared to disperse. Most of all we were happy to take refuge in the mountains of Shenandoah National Park during another hot spell in the valleys below. 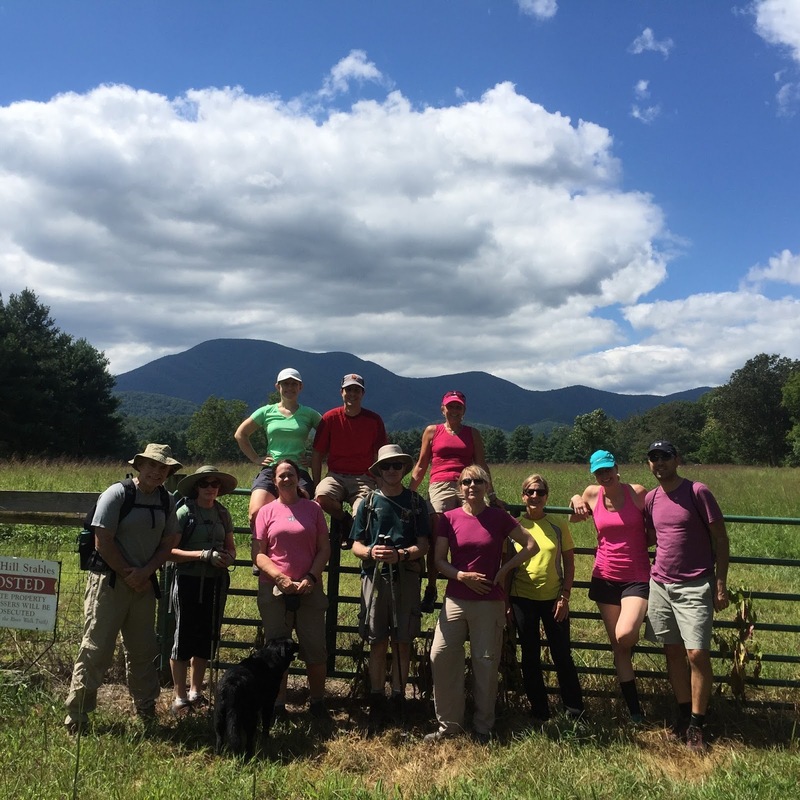 Twelve hikers joined leader, Marit Anderson, for a Nelson County day. The group included Jodi Frederikson, Dave Abdallah, Susanna Williams, Marian Styles, John Shannon, Iva Gillet and pup- Remi, John Sinclair, Ginny Barber, Nancy Handly, Brad Young, and newcomers, Jennifer Geyston and Kerem Cosar. We first hiked the 4 mile out and back Lower Shamokin Falls Trail, which is part of the Wintergreen Resort trail system. The route varied from a fire road to a steep ascent and rock scramble up to the last falls. We enjoyed a short snack on the cool September day and all was well until we had two members slip on the wet rocks on our descent. Fortunately both ended up being able to hike out and were checked on frequently. Trekking poles help, but slick rocks can be quite tricky. After completing the Lower Shamokin Falls Trail we drove to the Rockfish Valley Trails and hiked along the Rockfish River and around the meadows for nearly another 2 miles as the day warmed up, prompting us to be ready for refreshments and lunch at the Bold Rock Cidery. Everyone seemed to enjoy the views and cool breeze off the back deck. Quite a relaxing way to spend Labor Day Saturday.